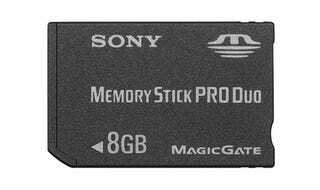 Big news from the Sony camp today—they're embracing 1999's flash-in-the-pan fad and have launched their first line-up of SD cards. Hopefully that spells the death of the evil Memory Stick and sliding disinterest in their propriety formats. There's five SD/SDHC cards and three microSD/microSDHC cards on offer, all class-4-speed. The 2GB SD is $14.99, and for SDHCs the 4GB is $29.99, 8GB is $44.99, 16GB is $79.99, 32GB $159.99.